This Relaxing, Elegant And Cool Mountain Cottage Awaits You! On the Kona side, safe and away from the volcanic activity, the Cottage awaits you. The perfect, peaceful getaway for those on a honeymoon or looking for a relaxing, romantic experience. This warm, welcoming, newly-built and finely crafted studio cottage provides modern comfort while retaining the spirit of old Hawaii. This mountain paradise is surrounded by native Hawaiian ohia and pine trees. 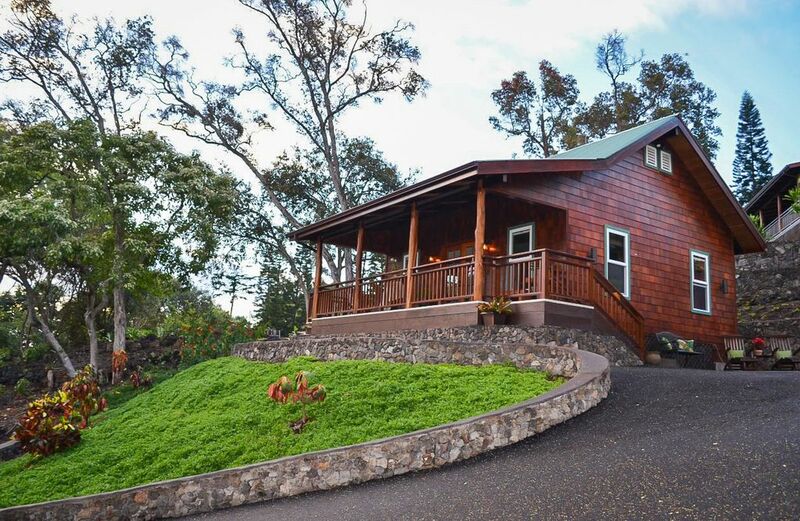 The Cottage at Ohia Place is situated in North Kona, at a cool 1600' elevation on Mount Hualalai in Kaloko Mauka. The cottage is close proximity to Kailua Kona village, shopping, restaurants, beaches, activities, the harbor, hiking trails and upcountry golf courses. The airport is 15 minutes away. The accommodation features open beam wood ceilings, ohia hardwood floors, mahogany and granite kitchen, brand-new queen -sized bed (with a Memory Foam topper), large slate shower, fully equipped kitchen with new appliances and a lovely lanai that enhances the inside/outside lifestyle of Hawaii. The cottage is 720 sq feet under roof, including the lanai. Your host will provide you with details about the many island activities, tours, sight-seeing, beaches and cultural experiences as well as shopping and restaurants, all within an easy driving distance from your home. Born and raised in Kona, the host's father was one of the founders of the sports fishing business in Kona in the early 50s; she and her family remain closely involved with the fishing community. She has spent her professional life welcoming guests and connecting them to the rich traditions of the islands. We love the island of Hawaii: the vastness, the colorful and unique local customs, the sunshine and sunsets of the Kona Coast, and the hunting and fishing traditions of the Big Island. A vintage picnic basket is available for your pleasure. If you're headed out to explore the island. You are welcome to use a cold bag for shopping, cooler, beach chairs and towels. This is a place you will call home... will want to remember... and will return to. Born and raised in Kona, Gale's father was one of the founders of the sports fishing business in Kona in the early 50s; she and her family remain closely involved with fishing community. She has spent her professional life welcoming guests and connecting them to the rich traditions of the islands. We love the island of Hawaii: the vastness, the colorful and unique local customs, the sunshine and sunsets of the Kona Coast, and the hunting and fishing traditions of the country. You will enjoy the rural country setting of coffee, avocado, mango, lychee and pasture lands adjacent to the cottage. Sounds of nature - birds, singing tree frogs and a visit from Sadie our Lab. From 1600ft elevation you will see the vast ocean with coastline through some trees. Private driveway and parking right next to the cottage with a locking gate. The cottage does not have a fitness room...a Yoga mat is there for you to enjoy. While a studio is a livingspace and bedroom combined, you will find this cottage very spacious and comfortable with a 7ft couch and coffee table. Toaster oven that makes perfect toast! A carved Brazilian wood circular table seats four guests inside the cottage. Two people may sit comfortably at the lanai table. Smart TV, including Netflix streaming and Pandora plus standard television channels. The Smart TV can be swiveled toward the bed or toward the couch. i-home docking station with music. The cottage sits on a half acre surrounded by coffee farms. The entire property is 1.5 acres. Enjoy morning coffee or an afternoon visit on the lanai. The lanai is 32ft x 8ft and faces southwest. A comfortable spot to unwind and enjoy a tasty cup of Kona coffee and a bite to eat. The lanai table seats two. Makalei Golf Course is five minutes away. Turkish cotton robes, luxury linen and towels, and organic soaps are supplied. Beach towels, beach chairs and a cooler are also available. A lovely picnic basket may be enjoyed on a romantic getaway. The property is fenced, with a separate entrance from the main house. The Ohia Cottage rivals the most upscale hotels, in terms of quality of facility, amenities, and attention to detail. We arrived as visitors, and left feeling that we had been treated as friends. This place feels like a beautiful home. Most important, the owner doesn’t just SAY “Aloha...” she LIVES Aloha. Thank you for everything, Gale. What a treasure your place is! It is a beautiful, charming and tranquil spot. Everything was immaculate and we had every convenience needed. Very highly recommended! Perfect place on the Big Island! This cottage was perfect for our recent trip to the Big Island. Close enough to town that it’s not hard to get around, but far enough away you feel like you are away from it all. Gale was the perfect hostess and was very welcoming and helpful in helping us during our stay. The cottage has perfect amenities and made for a great place to relax during downtime (or during the tropical storm that passed through). We ended up staying a few days on the other side of the island but regretted not just staying longer here! We will definitely stay here again the next time we make it out to the Big Island. Gale’s beautiful cottage was designed with love and attention to detail making it delightfully comfortable. As a hostess, she was accessible but not intrusive. She offered terrific suggestions for restaurants and sights to enjoy during our first visit to Kailua-Kona. Doesn’t get any better than this!